Carbury the grianan of Connaught. Although Calry was also known as Callgach back in the County Sligo Survey of 1633, there is little doubt that “the Hill” referred to above is Cruckmore (Cnoc Mor) located centrally in Colgagh townland from which most of Calry can be seen on a clear day. The photos included on this page are all taken by contributors to the photo competition on the Facebook group I live/lived in Calry. The views from Calry are very fine, expanding as you mount, but losing in distinctness of object and vividness of colouring, what they gain in extent. About half way up the slope you get the most satisfying prospect ; for while you have then under the eye, a large extent of country stretching from the sea to the Leitrim mountains, and from your stand-point to the Slieve-da-En, and Slieve Gamh ranges you are still near enough to escape all sense of confusion or crowding in the objects, to realize the undulations of the surface, the outlines and extent of groves and lands, and the well rounded contours of Knocknarea and Cairns, and to perceive and appreciate the various and ever varying shades of the landscape from the bare rock and purple heath of Knocknarea, to the rich, soft, and shining green of Belvoir and Tawnaphubble. A good perspective of the Calry area can be had looking north from Sligo Racecourse or from the road to the Holy Well. The area is bounded by a ring of mountains to the north and east ranging from Cashelgal across to Keelogyboy. 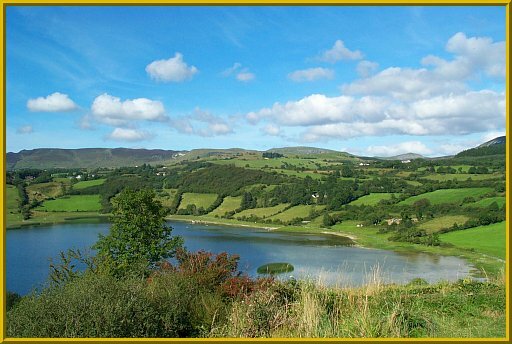 The southern part of the landscape is bounded by Lough Gill and the Garavogue river. The mountains that border Calry include Cashelgal (1423 feet), Crockauns (1527 feet), Hangman’s Hill (1321 feet) and Keelogyboy (1446 feet). Cruck (Cnoc) Mor is most probably of the rhyme quoted above. It is located in Colgagh townland and overlooks Lough Colgagh. A hazel forest is on the southern side facing the lake. Another prominent hill (name?) dominates the townland of Formoyle. Almost half the area of Lough Gill is located in Calry including many interesting islands (Innisfree excepted) three of which were inhabited well into the twentieth century. The Garavogue rived, which is the shortest in Ireland, flows from Lough Gill into Sligo estuary, a distance of about one mile. The Glack river rises in Glackbawn and joins the Dunally River at [where]. The Gostia river rises [where] and joins the Dunally river at Fawcett’s Bridge. The Cambo river rises in the grounds of Ballyglass House in Ballyglass towland and flows into Lough Colgagh. The reservoir at Kinsellagh is served by two rivers (names?) and was constructed in <year> to provide the town of Sligo with a clean water supply. A smaller service reservoir is located in Farnacardy townland and is accessed from the Barroe side. Deer were originally within the Deerpark (Magheraghanrush townland) and kept there for the sport of the Wynne family of Hazelwood House. Nowadays deer are to be found – where?